Kiwi fruit is an excellent source of Vitamin C. Aside from Vitamin C, it also contains Vitamin A and Vitamin E which are essential for healthy and beautiful looking skin. Aside from many health benefits, kiwi is also rich in antioxidants and enzymes. 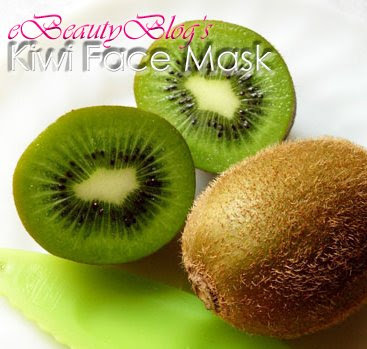 Using kiwi as a face mask will help tighten pores, eliminate oily skin, dark spots and skin impurities. It also help nourish and calm the skin. Using one or two kiwi, peel of the skin, chop it into small sizes, then blend it using a spoon or a blender. Apply the blended kiwi directly onto the skin. This will help exfoliate and cleanse the skin making it feel smooth and soft. When applying only kiwi to the skin, it may sting a little bit. This means that the acid from the kiwi juice is working in eliminating the impurities on the skin. Rinse face with lukewarm water after 15 minutes. Follow with toner and moisturizer. Blend the two ingredients together. Add plain yogurt if you want that extra softness on skin. Cleanse your face well before applying the mask. Leave it on for 15-20 minutes then rinse again with lukewarm water. Follow with toner and moisturizer. Notice: If you have never apply kiwi on the skin before, it is best to take a small slice and test it on a small area of your skin. If you feel any discomfort, please don't proceed with the face mask.